Sniffing is a common way for animals to greet each other. Most of us have seen dogs or cats vigorously inspecting a new acquaintance by sniffing, and we assume they're simply smelling each other. But there might be more to these encounters. New research, published March 7 in Current Biology, shows that rats sniff each other to reinforce their social hierarchy and prevent aggressive behavior. Daniel W. Wesson of Case Western Reserve University found that sniffing behaviors communicate information about an individual's social status, with more dominant rats doing most of the sniffing. Scientists have long known rats can communicate through vocalizations, odors, physical contact, and visual signals; Wesson's study adds sniffing to this list of communication methods. Wesson put sensors in rats' noses to measure nasal respiration (i.e., sniffs) and mounted wireless transmitters on their heads to record the data. Then he paired up rats to see how they interacted. Rats naturally form complex social hierarchies, with males dominant over females and large males dominant over smaller males. Wesson found when two rats approached each other, the more dominant rats (large, male) sniffed more frequently, and the subordinate rats (small, female) responded by slowing their own sniffing rates. Wesson hypothesized the dominant rats' increased sniffing serves as a conflict avoidance signal, and the subordinate rats' decreased sniffing acts as an appeasement signal. Indeed, Wesson found that when a subordinate rat didn't slow its sniffing soon enough, the dominant rat would respond aggressively. Wesson performed two more experiments to check his hypothesis. First, he temporarily rendered the rats unable to smell to determine whether the sniffing behavior depended upon the transfer of odors. Dominant rats continued to sniff just as frequently as before, even though they couldn't smell anything, and subordinate rats still slowed their sniffing, demonstrating the sniffing behavior is independent from olfaction. In the final experiment, Wesson treated the rats with oxytocin, a hormone known to increase affiliative behaviors and decrease aggression in rats. He reasoned that treatment with oxytocin would weaken the rats' social hierarchies, and this should eliminate the sniffing behavior. Wesson found oxytocin made dominant rats much less aggressive and reduced the reciprocal sniffing displays between dominant and submissive rats. These results bolster the hypothesis that the rats' sniffing behavior is dependent on social status. 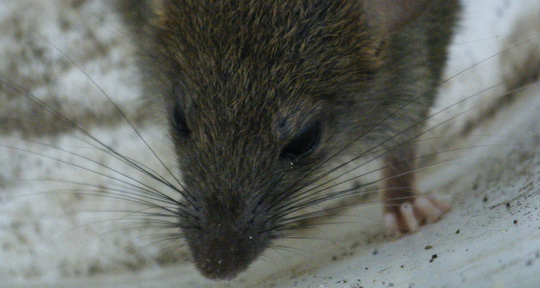 This study show rats use sniffing not just to sample odors, but also to communicate. The reciprocal sniffing behavior Wesson documented is as much about conveying information as collecting it. How one rat sniffs another reinforces their places in the social hierarchy. These findings present a new view of how rats communicate through social behavior. And Wesson thinks this sniffing behavior is not likely to be unique to rats — sniffing as a form of communication may be common among many types of animals and occurring right under our noses.